How to use Locus Map on a PC?Locus	How to use Locus Map on a PC? A lot of our users dream about using Locus on their PCs. 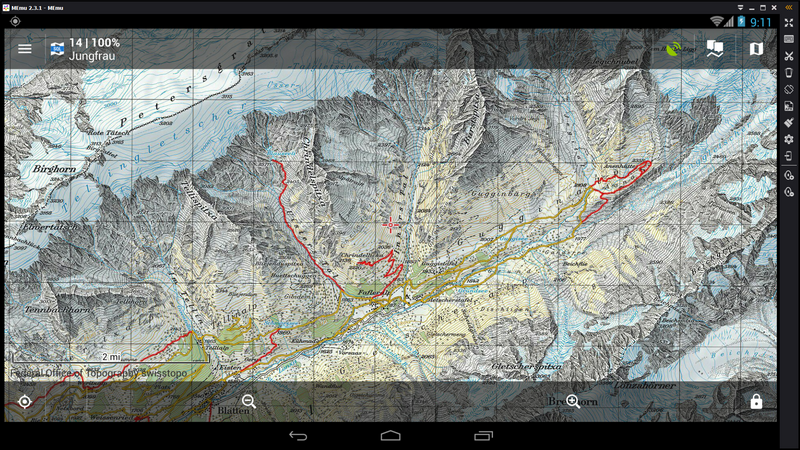 Imagine browsing your favourite maps or planning your routes on a big screen – that’s just too tempting. But Locus is developed for Androids only, then what the heck? Is it possible anyway? Yes it is. However, we have to use so called virtual computer for it, in other words a virtual engine or also Android emulator. That’s a special software perfectly simulating Android environment within a PC or a MAC and thus allowing installation of Android apps. There are many emulators available and obviously we use some of them for Locus development. And now we’re going to share some of our experience with three of them. “The heaviest caliber” right from the start. Genymotion is an advanced tool allowing simulation of a whole range of virtual devices at once. It offers a selection of not only custom mobiles and tablets but also a lot of “real” devices of well known brands like Nexus, Galaxy, HTC or Sony, running on various versions of Android OS from archaic 2.3.7. to up-to-date 6. The link to the installation pack can be found on www.genymotion.com. If you need Genymotion for personal testing only, which is probably the case, choose the free individual program. Other full featured paid versions are suitable for the app development. Select the installation pack according to your PC OS (Windows, Mac or Linux) and download – all is possible after registration though. If you are new to the virtuals, we recommend downloading of the pack with integrated VirtualBox from Oracle. The installation wizard goes through the process smoothly, the VirtualBox is installed individually. Be prepared for a temporary interruption of your internet connection when the software configures its own networking. As far as Genymotion is actually just a virtual device manager, it’s necessary to install at least one machine. Click + Add button in the upper panel and choose in the vast portfolio of devices and Android versions. When you have installed one, start it by double-clicking it or just push the Start button. The first drawback is that the virtual devices in Genymotion portfolio don’t contain Google apps nor services (GAPPS). Therefore, if you want to install Locus from your Google Play, you have to add the services first. How to tackle with it see here >>. Unfortunately the process isn’t that simple which may be discouraging from using this hi-tech software for many of you. Another possible solution is installing Locus directly from an .APK file that can be obtained e.g. here >>. This way you can get only Locus Free and it’s not always up-to-date – Pro version needs license validation processed via Google Play Store. If you have the .APK, just drag-drop it to the virtual device screen and the installation begins. If you won the first battle and Locus is successfully installed on your virtual device, you can start it and use it the same way as in your mobile or tablet. Anyway, keep in mind that the virtual takes as much of your PC system sources as it is set up for. So if you installed a “beast” like e.g. Samsung Galaxy Note 5, expect deceleration and lagging of your PC. How to set up the location? 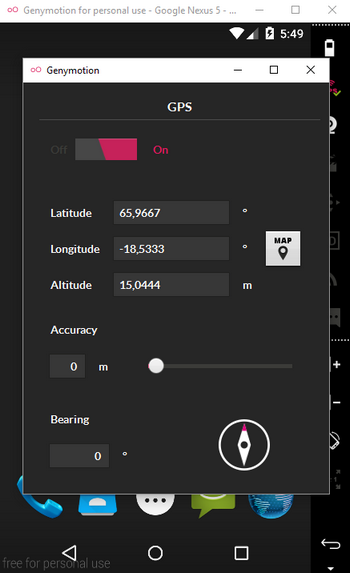 Free version of Genymotion enables setting up fake GPS location. Click the GPS icon in the left control panel of the virtual and set coordinates. 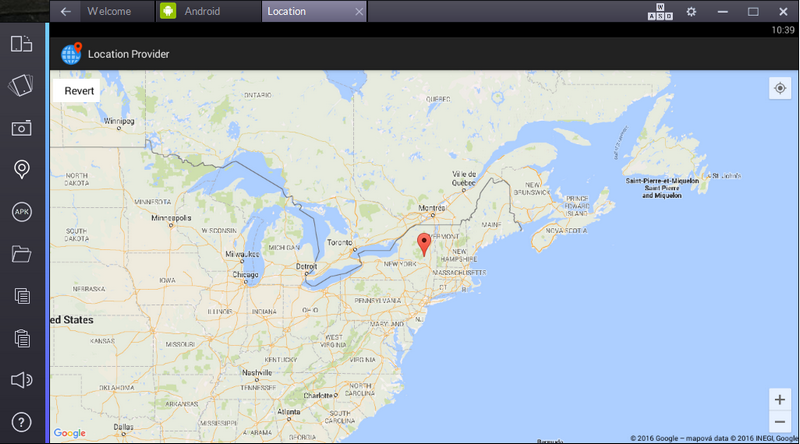 If you click the Map button, you can place your position directly on a map or you can use Google place search. How to get PC files to a Genymotion virtual? One of the most user-friendly way is utilization of an ADB plugin of a popular Total Commander. It displays the virtual as a network drive into which you can copy your files, maps, points or tracks as you like. Just open sdcard/Locus directory that is usually placed in the virtual root. There are several ADB plugins available, we prefer this one >>. When importing data to Locus don’t expect that you’ll be able to browse your PC HDD or USB flash stick. Locus obviously “sees” just the directory structure of the virtual machine – you have to copy your files into it first. A completely different piece of cake is BlueStacks. It even doesn’t address itself as an emulator. You’ll find in the software description that it is an “App player”. So clearly it’s targeted on absolute tech ignoramuses. It offers only one environment, it doesn’t bother with a bulk of devices or Android OS. You just install it, launch it, download Locus via integrated Google Play Store and “play”. Not all is as simple as it seems. Www.bluestacks.com offers the installation pack for sure (cca 239 MB) but after the install the launch is strangely long, sometimes it seems likely to crash. I managed to start the Google Services only after a few unsuccessful attempts, always waiting for “something” going on in the background. The software offers also full synchro with your mobile via its own Android app AppCast. As far as we’re talking about Locus only, it’s useless complication. How to use Locus in BlueStacks? BlueStacks in its basic window called Android offers lots of various apps for download, especially games as it is focused mainly on gamers. If you want to install Locus you have to find it via Google Play search where you have to log in first. After the installation Locus appears in the upper category of the last used apps where you just click it and another window opens, distinguished by a tab in the upper bar. It’s quite convenient solution for multitasking. But don’t expect any performance miracles -BlueStacks bites a mouthful of your PC sources too. How to set the location? It’s similar to Genymotion settings but much simpler. Click the GPS icon in the left control panel and pick your position on a map. Don’t waste your time by looking for place search or direct coordinates entry. 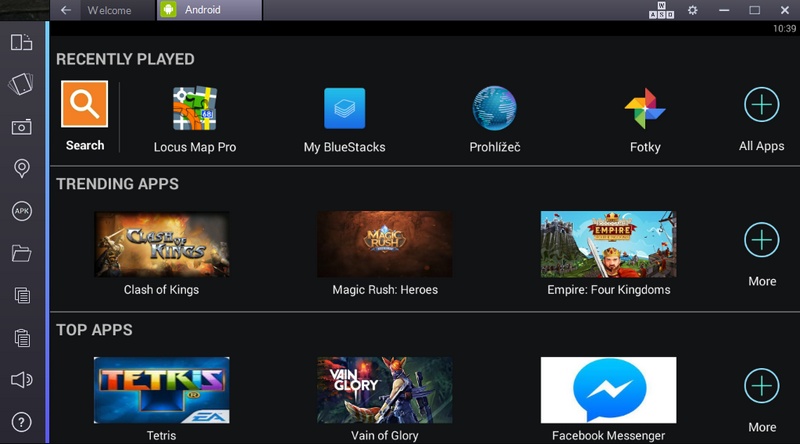 How to get files from my PC to Locus on BlueStacks? Click the folder icon in the control panel and find your file via your system file explorer. Click it and a selection of apps for processing the file emerges. Unfortunately even if you choose a map or a track, Locus is not among them. Select the last one – Send to Windows. 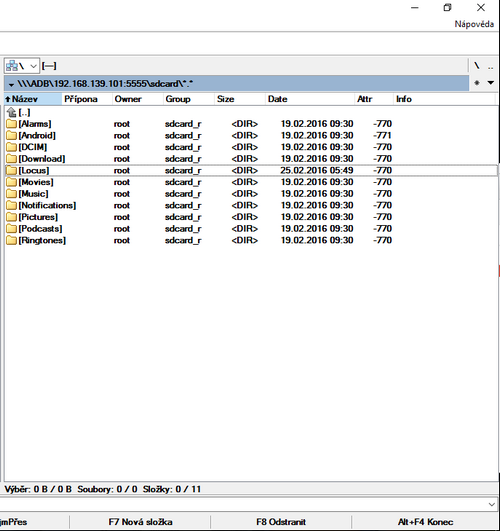 The file is copied into sdcard/Windows/BstShareFolder in your virtual directory structure. You’ll transfer it from there with any Android file manager anywhere you need on the virtual drive – maps into Locus/Maps, backup files into Locus/Backup etc. If you want to import anything into Locus, you have to have the data in the BstShareFolder first – again, Locus can’t get into your PC system directory structure. The last but not the least. MEmu is an emulator connecting simplicity of control and high performance without detectable weakening your PC. Unlike Genymotion or BlueStacks it doesn’t need an army of background processes running even if the app is off and it boasts by almost double number of points against BlueStacks in AnTuTu benchmark. Its development is so far in the beginning and many can be repelled by the fact that its website has Chinese suffix and the virtual itself contains some Chinese appstore. Anyway, that you don’t have to notice a bit – MEmu has also Google Play where you can download Locus from as you are used to. Not even here the download of the installation pack is without hitch – the antivirus didn’t like the main storage – it flagged it as malware-infested. Not much credibility for the start. The OneDrive (Microsoft) mirror, however, was finally clean and the following installation as well. Very simply – the software in its basic settings behaves like an ordinary Android 4.2.2. tablet. 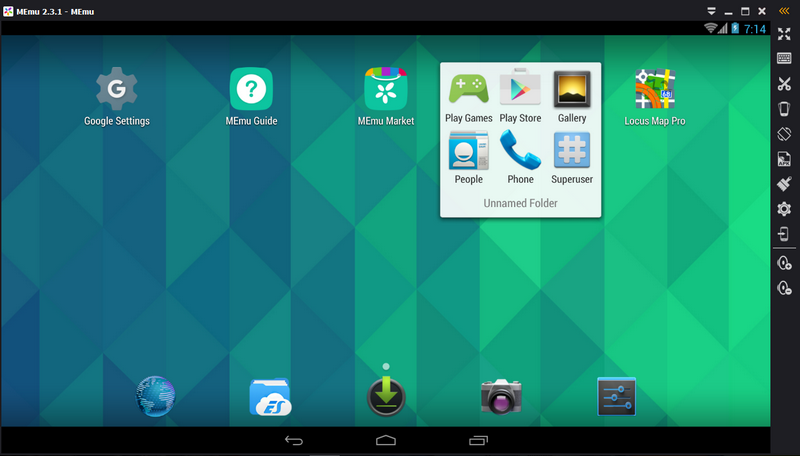 All entry apps including Google Play Store are placed in a folder on the screen, Locus emerges right next to it after installation. In the virtual machine settings that can be found in the right control panel you can set number of CPUs, size of RAM and the screen resolution. 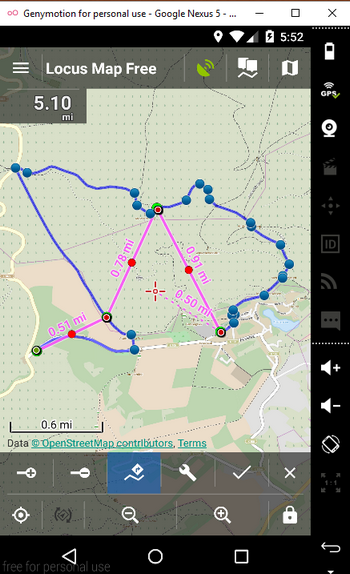 GPS settings are on the same place in an individual tab. 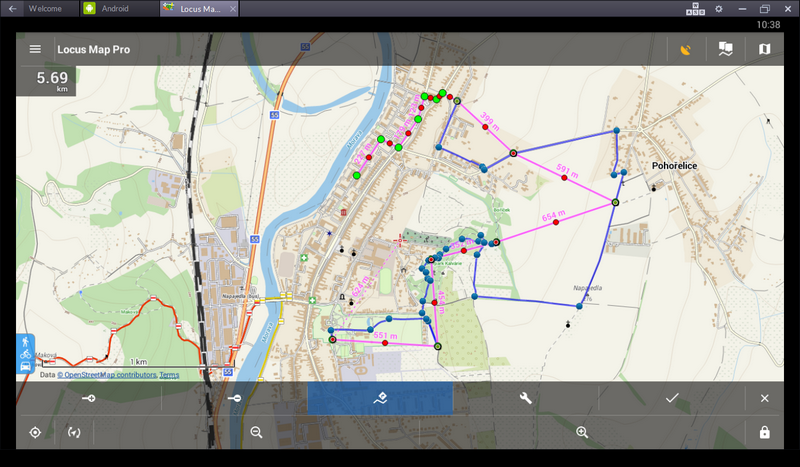 It contains map as well as all previous virtuals and also Google places search. Hot to get my files from PC to MEmu? By two ways. Firstly you can use our favourite ADB plugin we mentioned before when talking about Genymotion – it’s ideal solution. For those who for some reason don’t use Total Commander there is a shared folder, in default settings placed in C:\Users\user\Downloads\MEmu Download. Of course you can change its location. Its contents are mirrored in sdcard/download folder in the virtual device’s directory structure. Well, the choice is yours. Do you want deeper insight in problematics of virtual devices? Do you want to test Locus on various devices and Androids including version 6? Then select Genymotion. However, count with problems with GAPPS installation and demanding PC performance requirements. Much simpler solution is offered by BlueStacks, proven by years of practice, and bringing also option of synchronization between PC and your mobile. The smoothest performance was brought by MEmu, offered by some unknown Chinese “indie” developer whom not everybody will trust. 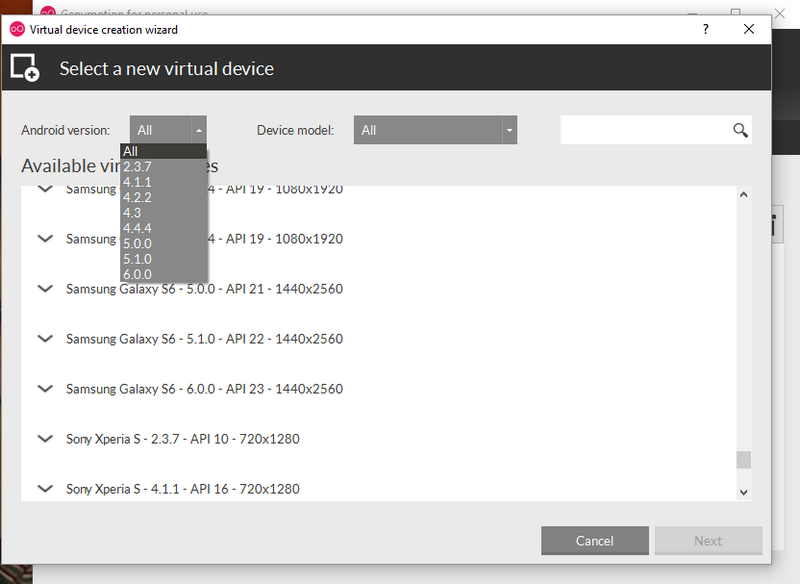 We, on the contrary, were very satisfied – amount of settings options is just enough and communication of the virtual machine with the ADB plugin was without issues. 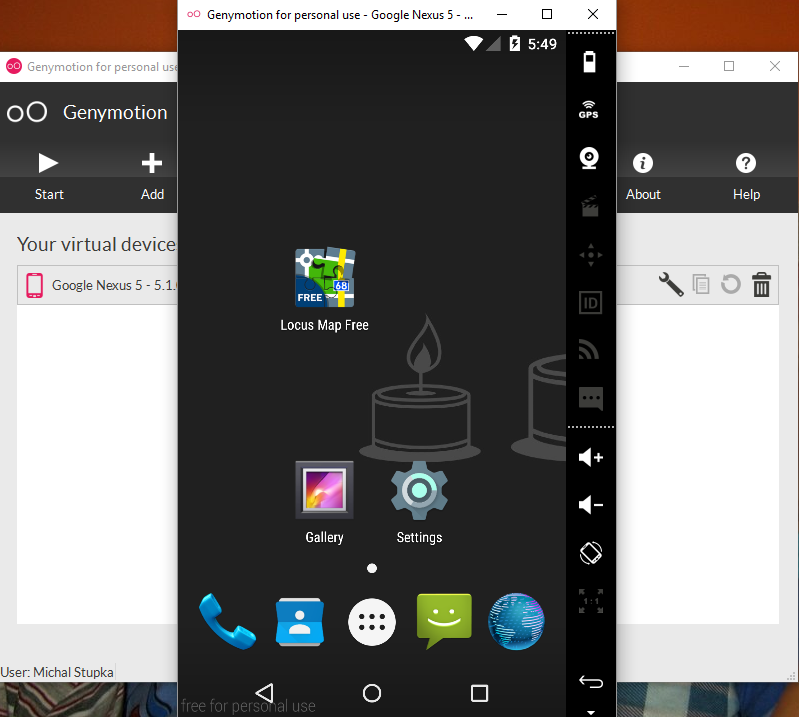 I tried to install Locus on a virtual Remix OS, and it works quite well… next is to check if we can use an external gps: i guess that’ll be more troublesome as there probably won’t be decent support for it in the os itself… will have to find out. “How to get PC files to a Genymotion virtual? VirtualBox starten -> VM auswählen -> Ändern -> Gemeinsame Ordner hinzufügen. Fertig. Diesen Ordner findet man dann auch im Genymotion-Androiden wieder. Great list! Those with Parallels desktop can run a x86 Android image http://www.android-x86.org/documents/installhowto. The resolution can be set by changing a parameter to vga=ask and selecting the desired resolution or filling vga or UVESA_MODE paremeter if you know how. Not all the biggest resolutions work though. These days you should also consider Remix OS http://www.jide.com/en/remixos Although I’m not sure if you can emulate it, but maybe the point would be that you don’t have to, it runs on your old pc natively. It has support normal keyboard and mouse usage and also for all of the android apps.